How to upgrade a theme ? We often release new versions of our themes. Those new versions either fix bugs, introduce new features, improve performance (or sometimes remove features that were problematic). Unfortunately, there is no way to upgrade easily a theme in Shopify, and for good reasons. 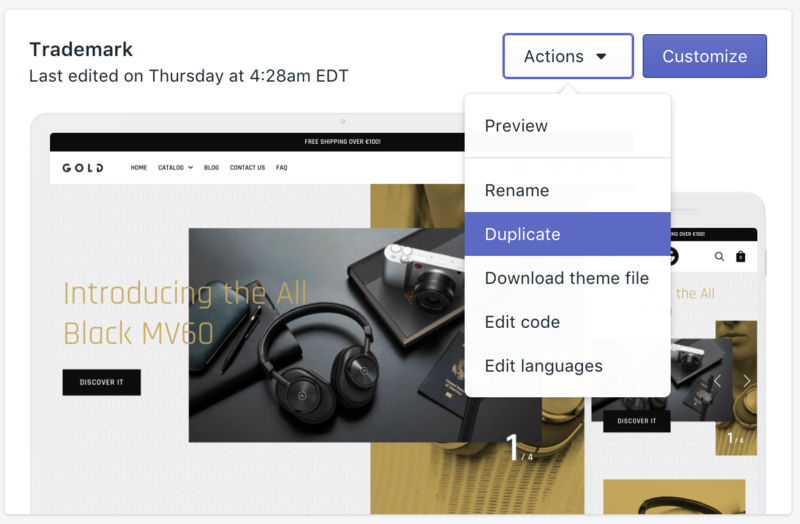 Because you can install app, modify the code of the theme, and do all kind of changes, if Shopify would auto-upgrade your themes, all your custom changes would be erased. As a consequence, when you download a theme from the theme store, you automatically download the latest version. The good news is that you can re-download a theme as many times as you want, for free. The upgrade process is a little long, and we actually recommend you to not do it if you don't experience any major issue with the theme (your theme will still continue working, even in 5 years). Also, if you are looking for a specific bug fix, you can also directly contact us, and we'll be happy to fix this bug in your older version. If you still want to upgrade, here are the steps. While optional, we always recommend you to create a back-up of your current published, working theme, just in case. Once the theme has been duplicated, you should see the copy in your list of unpublished themes. You can give it a more meaningful name like "Theme - backup". This will ensure that the new theme is not visible to your customers yet. Now, you should have the new theme as an unpublished theme. You can rename it to a more meaningful name so you can more easily modify it, like "New theme". if you have installed any app that required changes to the code, or if you have hired a developer to do custom changes, you'll need to re-do the change or re-hire those person to do the changes again, as the theme you've just downloaded is a new one, like the one you've downloaded at first. Test the new theme extensively and make sure everything works as expected. Once you're ready, simply publish the new theme as the main theme. We highly recommend you to not delete the old theme and to keep it two or three months, so that you can always go back to the old one if something bad happen.